Attention all pizza lovers! Whether it's making a homemade pie from scratch on family pizza night or a frozen store-bought pie, assure a perfectly cooked, crispy crusted creation when removed from the oven. The Pizza Crisper is designed to allow your pie to bake to crisp, golden perfection quickly and easily. 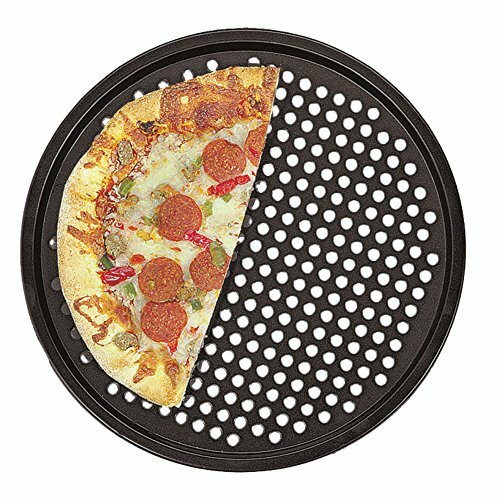 Made of sturdy carbon steel, the tray features a must-have perforated surface for even heat distribution and air circulation, with a convenient non-stick surface for easy removal and cleanup. The pan is also great to reheat leftover slices or use to cook frozen crispy french fries, chicken and more! Bake a pizza parlor-worthy pie, with a crunchy, crispy crust, right in your own kitchen.